£1,899 per person for 10 nights (£1,954) for an Inside cabin. £2,291 per person for 10 nights (£2,391) for an Outside cabin. £3,244 per person for 10 nights (£3,494) for a Superior cabin. £4,069 per person for 10 nights (£4,569) for an Suite cabin. 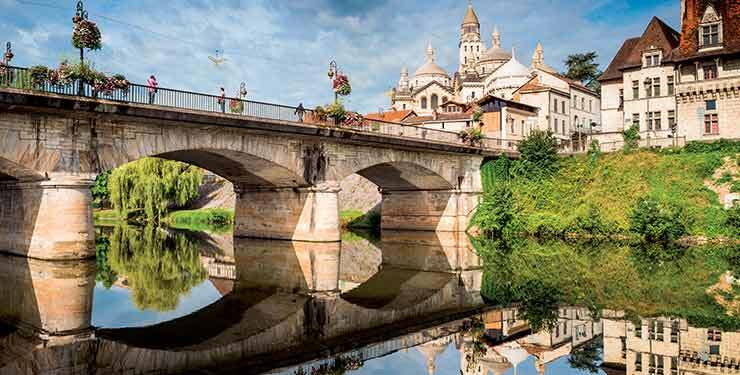 sail up the Garonne River into the centre of Bordeaux and enjoy a whole day exploring the vibrant UNESCO-listed city. let Baron d-Anglade and his wife take you on a guided tour of 17th-century Chateau d’Abzac, including a special wine tasting. Experience a fusion of French and English flavours in gourmet Guernsey and try Gache, a fruity bread smothered with Guernsey butter. In Bordeaux pace a vineyard to learn about the regional viticulture, then join a tasting to discover regional taste and classification. For a plethora of gastronomic delights shop in Libourne’s Farmer’s Market on an exclusive excursion and in Le Verdon you can sample oysters farmed in the Bay of Arcachon. For an alternative culinary view dip a toe into Spain for a morning visit to O Berbes market to see a superb array of fresh fish and seafood. Or, spend happy hours hiking a stretch of The Way of St James to Santiago de Compostela, stopping to taste Galician wine and tapas, or for some Spanish culture take a tour of this famous pilgrimage city and be all ears for a harmonious performance by a choral group. 17 September: Dover, England. Embark Saga Sapphire. Depart 1600. 18 September: St Peter Port, Guernsey. Arrive 0800. Depart 1600. 19 September: Lorient, France. Arrive 1000. Depart 1800. 21 September: Vigo, Spain. Arrive 0800. Depart 1600. 22 September: La Coruna, Spain. Arrive 0800. Depart 2100. 24 September: Bordeaux, France. Arrive 0200 on Sep 24. Depart 0230 on Sep 25. 25 September: Le Verdon, France. Arrive 0630. Depart 1600. 27 September: Dover, England. Arrive 0800. Disembark Saga Sapphire after breakfast. 2) Offer is only applicable to A French Hamper. 6) A reduction of £22 applies if you do not need the optional travel insurance and additional cancellation rights. 8) Includes door-to-door travel service, return chauffeur service within 250 miles of the departure port, standard class rail travel from your local station, or complimentary parking at the departure port if you'd prefer to drive yourself. 11) To book, please call Saga Holidays on 0800 302 9753 or follow the 'claim now' button to book your holiday.